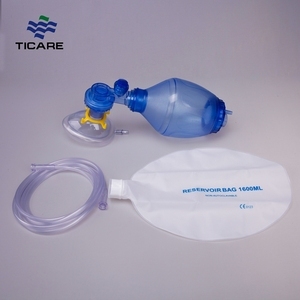 Reusable autoclavable silicone ambu bag including oxygen tubes, gas storage bag and 3 silicone with mask each for 1 pcs * When the accident occurs, especially difficulty in breathing or the need to improve patient use of supplementary oxygen. *Portable resuscitator, the first time in first aid and emergency use, you can quickly oxygen or unconscious persons CPR-BLS (the primary life-support) to facilitate the ready to immediately put into use, greatly increased hope of survival. * Carton size: with PP Box 56 * 36 * 44cm Speciality 1. All parts can be easily dismounted for cleaning and desinfecting 2. Its textured surface ensures a firm grip and providing effective ventilation. Provide positive pressure ventilation to patients who are not breathing or not breathing adequately. Q: How long is your delivery time9 A: Generally it is 3-5 days if the goods are in stock. or it is 15-20 days if the goods are not in stock, it is according to quantity. 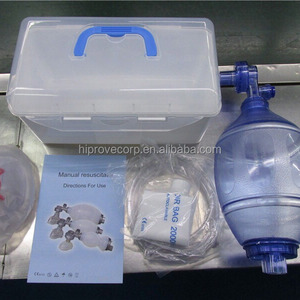 manual resuscitator Medical Appliances PVC Manual Resuscitator Product name Manual Resuscitator Color Transparent/Blue/Green Material Silicone/pvc Size adult /infant/Child/Neonate Certification CE/ ISO /FDA Delivery time 7-10days after payment Our Manual Resuscitator strength: 1.Fast making the sample 2.Good price with first class quality 3.Durable and long time service life 4.High effect for protection 5.Delivery on time 01. Manual Resuscitator made of quality and reliable. 1.For Patient weight above 40 KGS (Adult) 2. For Patient weight between 10- 40 KGS (Pediatric) 3.For Patient weight below 10 KGS (Infant) 02. Manual Resuscitator structure is like the picture. You can clearly understand the product structure 03. 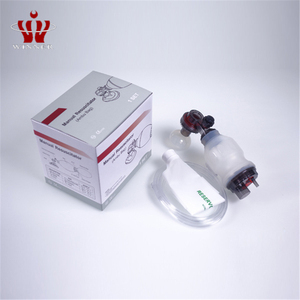 The mask of Manual Resuscitator is durable.